Today's post comes from author Jan Markley. I have a friend who loans me books and there are always weird bookmarks left in them. 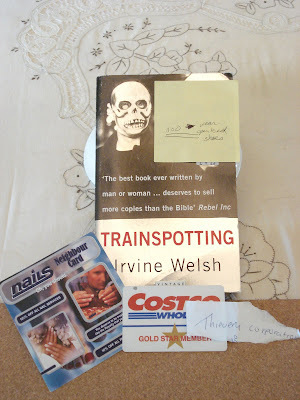 I have her copy of Trainspotting by Irvine Welsh and inside was a sticky note that read: "11 am wear open toed shoes," a scrap of paper with " thievery corporation" scrawled on it, a costco card and a coupon for a manicure. 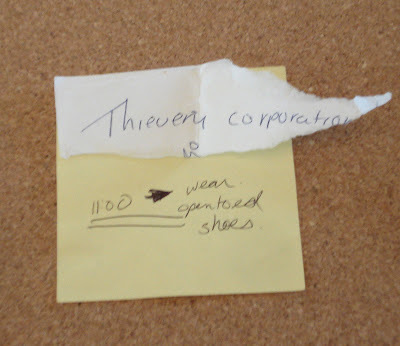 The bit about open-toed shoes is odd but Thievery Corporation is a band. Thievery Corporation is an awesome reggae band! Amber, the friend who's book it is, did a rebuttal of this post and defended her book stuffing ways!